Zamri says closed landfills cannot be used for other developments including housing projects as it requires different methods of treatment, so the park idea is ideal. OLD landfills that have reached their maximum capacity are often treated as dead zones, unfit for human occupation or activities due to the gas produced from decomposing waste. However, Worldwide Holdings Bhd has come to the rescue. The company has successfully rehabilitated three landfills namely in Air Hitam in Puchong, Kubang Badak in Kuala Selangor and Sungai Kembong in Hulu Langat. The 40ha Air Hitam landfill has been turned into a park since 2011 for the community called the World­wide Landfills Park Air Hitam. It housed a 5km-long jogging track, a bicycle track and a playground. Joggers are also allowed to track uphill and people are known for flying kites and enjoying the magnificent view from the garbage hill that is now green and lush. Noticeable among the greenery are 164 gas wells that still carried greenhouse gas to the renewable energy power plant that supplied electricity to 2,000 homes nearby. There is also has a leachate treatment plant at this place famous for being the first engineered landfill in the country. It initially opened its doors to waste in 1995 and was one of the main landfills serving several major local councils including the Kuala Lumpur City Hall, Shah Alam City Council, Petaling Jaya City Council, Putrajaya Corporation and many more. Worldwide Holdings took up the task including its maintenance as a corporate social responsibility project. It recently signed an agreement with the Selangor government to continue managing the post closure maintenance works for the three landfills for five years. The Selangor government will fund the RM1.5mil needed a year to manage the three closed landfills. Worldwide Holdings’ Environ­ment Division head Zamri Abdul Rahman said many were still unaware of the park’s existence. ‘We want people to come and use the facility as a green lung. We have ensured its safety and have posted guards as well. We intend to turn it into a brand and hope to implement the same for future closed landfills,” he added. Zamri said closed landfills could not be used for other development purposes including housing development as it required different methods of treatment, so the park idea was ideal. The company plans to turn the Kubang Badak landfill into a park in two years time. 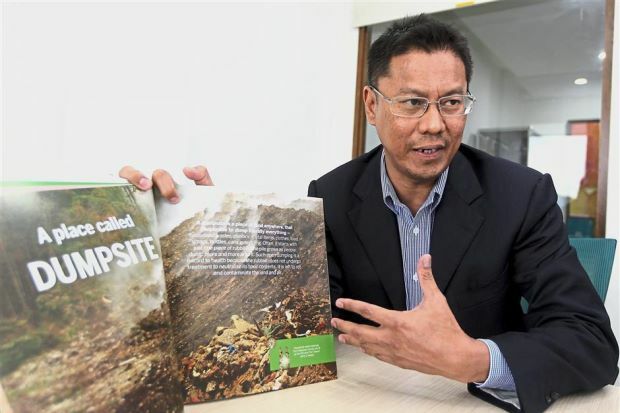 “The Sungai Kembong landfill, however, is a little far from development and may not attract people, so we are looking at other viable options,” he added.